We're Your Oven Grime-Scene Cleaners! We love to clean ovens! All types, sizes and levels of grime-scene! From our IT'S A GRIME-SCENE clean involving the Oven, Stove Top and Rangehood to our LITTLE OVEN OF HORRORS to give some TLC to your Small Oven. We love cleaning ovens so much, it really doesn't matter to us that you live thirty minutes out from the city - we'll still come to you at no extra charge. At Stubborn Oven, it's no secret that we love to clean ovens, professionally all over Perth. In fact, we love cleaning ovens so much, it really doesn't matter to us that you live thirty minutes outside of the city - we'll still come to you at no extra charge. Because we believe that every oven deserves to be clean, no matter where you live in the perth metropolitan area. Our professional oven cleaners will gently scrub and remove grease, grime, and carbon deposits from the interior. The oven racks are soaked in our unique bath designed to lift away charred, oily residue from their surface. The oven door is then removed and scrubbed clear of all grease and stains. We then give a slow, gentle deep clean of the oven interior and door. Once complete we dry, buff and polish the interior, the door and the racks. We reassemble the oven and polish the exterior knobs, handles and glass display leaving you with a bright, shiny clean oven! Be it Gas or Electric, we clean them all. We start by giving the surface of your stove stop a deep scrub that removes all burnt-on splashes, stains and saucy residues. If your stove has cast iron trivets, they are then soaked in our unique bath that works to lift away all grease and carbon deposits. Once complete, we then dry the trivets and stove top and finally polish and buff its surface leaving you with a bright, shiny clean stove top! We don't just offer exceptional stove top and oven cleaning services. Our team can also clean your rangehood for you too. 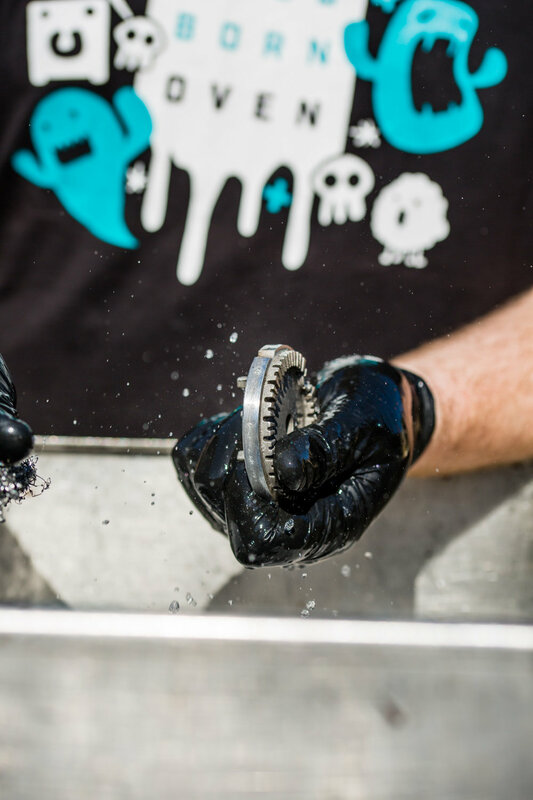 We start by removing the exhaust fan filters and then we soak them in our specialised bath; the bubbles work to lift all traces of oil, grease and carbon from the finely woven matrix. We then scrub clean the hood, reassemble the filters and dry the exterior. Finally, we give a thorough polish to your rangehood - leaving you with a bright, shiny clean rangehood!